"A wonderful combination of old and new. 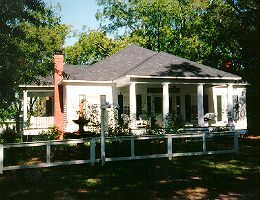 Marian and Pete Sorensen built this Greek Revival-style replica in 1992, balancing 19th-century style and 20th-century comfort. The guest rooms open directly off the oversized, grand foyer. At the end of the hall is the bright and airy dining room, with an over-sized country French dining table, overlooking the beautifully landscaped garden. The kitchen is stocked with chilled wine, glasses, and such treats as lemon pound cake. The innkeepers' quarters are separated by a screened porch/walkway - "we never even saw their sweet little dog, Toto, until we were leaving." Rooms: 4 doubles--all with full private bath, radio, clock, TV, air-conditioning, fan, fireplace. 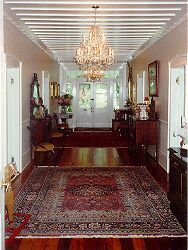 Facilities: Dining room with fireplace, foyer, porches. Location: Two blocks from town center. Restrictions: No smoking. Children over twelve.